Researchers at the University of Copenhagen have unveiled a profound biological process that explains how DNA can be damaged during genome replication. In addition, the scientists developed a new analytical tool to measure the cell’s response to chemotherapy, which could have an important impact on future cancer therapy. The results are now published in the scientific journal Cell. An international team of researchers led by Professor Jiri Lukas from the Novo Nordisk Foundation Center for Protein Research, University of Copenhagen have unveiled a process that explains how DNA can be damaged during genome replication, due to the lack of a critical protein. The scientists were able to visualize the process of DNA replication and damage directly in cells with an unprecedented detail. Cells need to keep their genomic DNA unharmed to stay healthy and the scientists were able to visualize the process of DNA replication and damage directly in cells with an unprecedented detail. 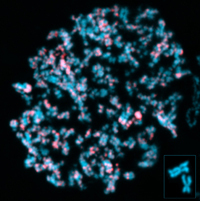 They discovered a fundamental mechanism of how proteins protect chromosomes while DNA is being copied (a process called DNA replication), which relies on a protein called RPA. Cells have a limited amount of this protein, which they use as band aids to protect the DNA temporarily during replication. If they use up the RPA reservoir, their DNA breaks severely and cells are no longer able to divide. “We now understand that many drugs used in chemotherapy are toxic against tumours because they make DNA replication difficult and force cancer cells to consume their RPA pool much faster than normal cells usually do. As a result, cancer cells are constantly at the verge of falling into a replication catastrophe, a condition from which they cannot recover, and which can be used as a powerful means to selectively eliminate cancer cells,” says Luis Ignacio Toledo, the first author of this study. In addition to helping other scientists to comprehend some of the most fundamental processes in cell physiology, the findings could have important implications for cancer diagnosis and treatment by helping understand, at the molecular level, what makes cancer cells different from normal cells. “The relevance of our discovery is that it provides an explanation for a broad spectrum of previous scientific observations, which on the first glance seemed unrelated, but which we now show can be unified into a simple comprehensive model to understand how proteins protect DNA from catastrophic damage,” concludes Luis Ignacio Toledo. The Novo Nordisk Foundation Center for Protein Research (NNF CPR) opened in the spring of 2009 and is an international hub for basic protein research, led by executive director Professor Jiri Lukas. The center covers diverse but complementary research areas including proteomics, protein-based mechanisms of disease, disease systems biology, and protein structure and characterization. All these research areas are supported by state-of-the-art technologies located in one building and NNF CPR is characterized by a unique internal synergy among all research programs. Research at NNF CPR aims at improving the understanding of disease at the molecular level, leading to improved disease diagnostics and treatment. The Novo Nordisk Foundation Center for Protein Research is supported by a large grant from the Novo Nordisk Foundation (DKK 600 million). The researchers at The Novo Nordisk Foundation Center for Protein Research have published no less than ten articles in Cell Press journals in 2013, including Cell, Molecular Cell and Cell Report. A major achievement for an institute of this size.